So it’s been quite a while and I would love to pick it back up and not drop the ball on you all again, but I know things have gotten pretty quiet around here again. Just wanted to check in, figure things might pick up again as they sometimes have around holiday... Thoughts?? I'd be happy to pick this up again The lore is pretty interesting, and I'm looking forward to learning more! Web. NightTears. Tigress. Silk. Vineda smiled at each in a friendly way, Shamrock sending a nod to each as they introduced themselves. Somehow they all seemed rather familiar with one another. Memories of a more active and social time threatened to turn into a wistful sigh, but she brushed the thought away. She was simply glad to see others drawn here now to meet this unbonded envoy. This Cipher seemed lit with an amusement that did not falter, a whimsical constant observation of the world around her. That in itself seemed to tug at the girl, made her want to speak more with her and see what new riddles the mare would answer with. Shamrock’s chuckled comment made her grin openly. What I wouldn’t give for an ‘overabundance of curiosity’ outbreak. Her thoughts, however, tugged at some of the other commentary. So the Bonded had a poor reputation, eh? The Factions hear rumors of us? Can you tell us more of them, that we will not be relying on rumors of them in return? One had to wonder where all the rumors came from. Then the winged one darkened a bit, and her worry spread across both bondeds’ features in response. The passion she displayed was contagious. Pitfalls thinning her Altar’s ranks? Dangrously letting Serians find their way alone? Was your quarrel over the Silent Song about their Bonding? Their ability? It struck her as the words left her how very direct she was being, and she bit her lip. Drawing herself in a bit, she shot a contrite look at the ethereal mare. She imagined this might amuse her, but she hated to think she may have been rude. Curiosity, indeed. Vin looked to Shamrock, curious about his thoughts. She knew so little about the guardian Serian Prophet, but had trouble grasping the concept of him recklessly endangering Serians from this Altar she’d just recently learned of. The brooding expression stayed on Sham’s face, but he did not share any concerns aloud. The challenge was weeding through all of the questions Cipher’s tidbits generated, but as she turned back to the mare another form neared. For all the subtle mystery that cloaked her, Cipher gave them their answers freely, and more forthrightly than Web would have expected. She did not miss the intensity with which they were each regarded, though—some unknown quantity moving under the stranger’s pleasant expression like a shadow on the sea. But those in Sethe’s keep were steeped in such maneuverings. Again, perhaps she’d been gone so long, tangled so deep, that she read some silent working when there was none. Watch. The touch on her mind still light and loose in its suggestion. Learn. There was the old wound between those Bonded and those who chose not to. She did not know how much NightTears knew of these things, being born to a Circle and not an Altar, but somehow his question had hit right at the root. Ah, kannagi-san—she should’ve known. He had gone so still beside her, after his greeting bow; she flicked her tail at him, just so, felt the cool dart of calm along their bond in return. Still here, still watchful. Fire sparked, licked itself into the mare’s words and expressions—the mention of the Silent Song, her Altar. Web recognized the ferocity, had worn the weight and shape of it in her own soul: my duty, my Bonded, mine to protect, mine to reclaim, mine to—mine. Her will, and under it the Bond, echoing, feeding. Her shoulder brushed against NightTears’ suddenly, and she could not tell which of them had closed the distance. 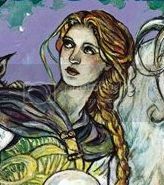 “Has Prophet kept you from your people, then?” she ventured, finding it hard, somewhat, to reconcile what little she knew of the Land’s guardian with all that Cipher now revealed. Interesting—the thought not wholly her own. But then the shift, the tension reined back and folded away, a mirror of the duality she’d claimed in her naming—and with this, another familiar face, and Web felt her heart warm as it hadn’t for a long, long time. Chaos, Gem, so many threads of her past woven into this stranger’s sudden coming. The tether in her soul tugged at her, sharply, cutting fine as a strand of her webbing. Our intention. Do not distract yourself. But she’d heard Shamrock’s question, Vineda’s, their clarity pushing farther than she had words to yet. Sethe had Bonded with no Silent Song as of yet, after all. NightTears pulled away from her, suddenly, a half-step forward as if by an unseen push—yet his eyes, when she looked to them, were still dark, still clear. "The Bond," he said, the word heavy even in his quiet tone. "What do you wish to know from us, to slake your curiosity?"